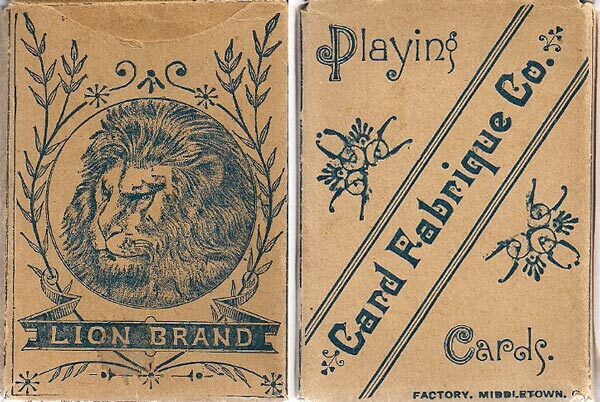 Lion Brand No.10 is one of over a dozen brands produced by the Card Fabrique Company between c.1875-c.1894. The picturesque Ace of Spades and the extra 'Joker' card used in this 52-card deck were also used in a 32-card Euchre version. The design of this Ace is virtually identical to one used by B.P. Grimaud of France except for the name in the rectangular box at the bottom. The hand holding a fan of cards was a popular motif used by several manufacturers in their artwork, including the Globe Playing Card Company. Card Fabrique Company had connections with several other manufacturers and their complete history is yet to be unravelled. Above: Lion Brand No.10 playing cards manufactured by Card Fabrique Company, Middleton, Ohio (USA) c.1880. 52 cards + Joker in box. Images courtesy Rod Starling, author of The Art and Pleasures of Playing Cards, Xlibris Corporation, 2008, 2010. 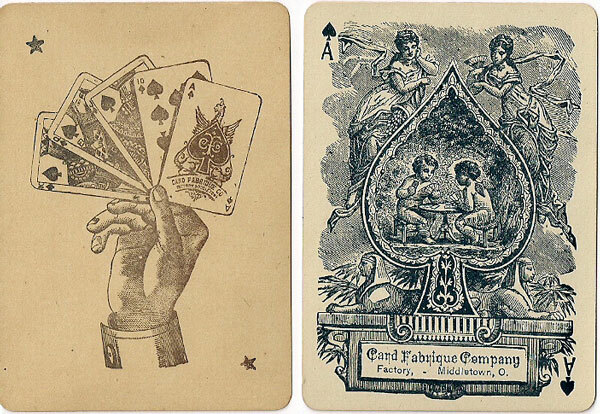 Rod Starling comments: "It is interesting to note that Russell & Morgan began making playing cards in 1881 and among the first brands issued by them was “Tigers 101” with a very similar box design to Card Fabrique Company's Lion No.10 brand. If the c.1880 date is correct for the Lion No.10 brand, then it would appear that Russell & Morgan may have chosen “Tigers 101” as a competitor brand a year later. On the other hand, if the Lion No.10 brand was issued after 1881, just the opposite may have been the case. However, Hochman states that Card Fabrique Company operated in Middleton, Ohio between c.1870 and c.1880 so it is a close call as to which brand came first." A Card Fabrique Co. Game Register with advertising, c.1881. Above & Right: the Game Register was used with 32-card Euchre decks with the engraved Ace and Joker shown above, and in this instance it also carries advertising for Dr Harter's Wild Cherry Bitters.